Heidi as a Hula Girl with Hawaiin coconut top and grass skirt. Accessory of Hawaiin Lei, head crowns, bracelet and flowers. 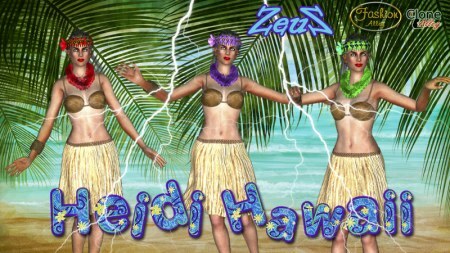 Description: Heidi as a Hula Girl with Hawaiin coconut top and grass skirt. Accessory of Hawaiin Lei, head crowns, bracelet and flowers. when do you expect CC ESSENTIAL ? Thank you very much Zeus !!! Can you please crack also "Character Creator - Stylized Kids & Teens"?